I've learned so much during our time in Exodus. Today what struck me as I studied chapter ten was the importance of passing down our stories of faith to our children. God tells Moses, in verse two of chapter ten, one of the reasons why He is performing the signs of the plagues in Egypt. It's something I've never really noticed until this morning as I studied. Isn't it wonderful how God opens up more and more of His Word to us as we commit to spending time in the Bible! Sometimes we forget that the painful or uncomfortable moments of our lives can be used for our children's own personal faith walk journey. As hard (or embarrassing) as it may be for us, we must let God use these moments of our lives to speak His truth into the lives of our children. I made many mistakes in my past before I was faithfully serving the Lord. Even as a Christian, there are painful lessons that I have had to learn in my walk with God. There have been struggles and trials that I have walked through that have enabled me to experience God in ways that I never would have had it not been for those times. Those are my faith stories that I can now pass down to my children to help them know that no, life isn't always a bed of roses, but with God walking faithfully beside us - we can grow stronger in our faith of who we know Him to be. Not only does God tell Moses to speak these stories to his son, but to his son's sons! We are called to pass down our faith stories to our grandchildren too! This March we will be welcoming our first grandchild into our family. My firstborn is having her first child! I cannot wait to meet him and begin to whisper my stories of faith into his precious little life. My cup truly runneth over! Observations: The words spoken by Pharaoh after the 7th plague (hail) would make one think that he was truly repentant, but unfortunately this is not the case. First, he owns up to his sin and declares God’s righteousness. He asks Moses to intercede for him so that God will remove the plague and makes the half promise to let him go – not even mentioning the release of the rest of the children of Israel – gives a slight glimpse into the true condition of his heart. These were picture perfect words from a man whose heart is not truly repentant for his sins, but is only troubled by the consequences of his sins. Moses already knew the truth of Pharaoh’s heart (and tells him so) because God had told him specifically what all the plagues would be (Exodus 4:22-23 being the final) and yet commits to praying to God on Pharaoh’s behalf. We see in verse 35 that Pharaoh’s heart continues to be hard and rebellious, refusing to let the children of Israel go as commanded by God. Application: Hardening our hearts against God’s will is sin. When we fail to repent and recognize the mercy of God when He graciously answers our prayers because we find ourselves under the correction of His mighty hand - that is sin. Is there any sin in my heart that God is trying to deal with? How am I responding to His efforts to lead me to repentance? Do I have trusted friends praying for me? Kneel: Heavenly Father, thank You for the gift of Your mercy and grace. I pray that I would always remember to examine my own heart in accordance with the truth I find in Your Word. I pray that my heart would always be soft and receptive to Your correction so that I can repent quickly and completely through the Holy Spirit’s power that lives within me. Thank you for trusted friends that I can have as prayer partners as we walk through this life together. I pray for those who are struggling with true repentance Father. May they realize the danger of continuing to harden their hearts against You and completely surrender with a godly sorrow that leads to true repentance. In the saving name of Jesus I pray. Amen! Observations: Pharaoh’s and his servant’s hardened hearts were the avenue through which God showed his mighty power in the plagues He performed. There is a purpose behind everything God does. With Pharaoh’s heart hardened against the One True God, God was able to bring to shame all the false gods of the Egyptians that each plague was specific to, and to glorify His mighty name to all that witnessed His glorious power. It was a faith story that Moses would tell his son and even his grandson – a faith story that would spread from generations to come. Application: What lessons have I learned in situations where I have had a hardened heart that the Lord has had to work through to show His power and glory? 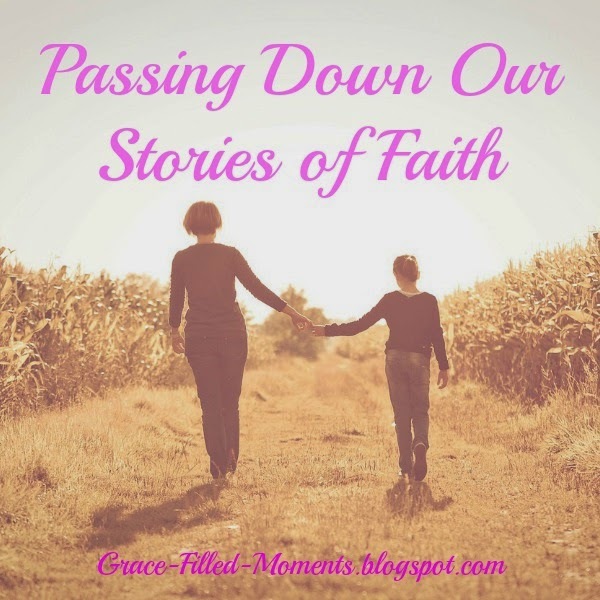 Are my husband and I sharing our faith stories with our children? Kneel: Heavenly Father, it’s so easy to point our fingers at Pharaoh and shake our heads. Forgive us for not using his story to examine our own hearts and lives. Search me, O God, and know my heart…see if there is any offensive way in me, and lead me in the way everlasting. In the powerful and mighty name of Jesus I pray. Amen! I'll see you back here on Monday for another Blogging Through the Bible post. 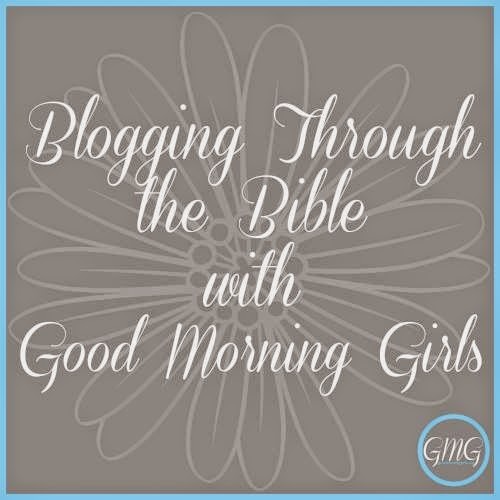 Click on the image below to read more posts from other bloggers who are joining Courtney Joseph over at Women Living Well, home of Good Morning Girls in Blogging Through the Bible. Thanks for joining me! *This post is also linked at the following link-up parties: The Missional Weekend Link-up Party and Worshipful Living.